Now I know that the SAG Awards aren't exactly the most-viewed or chatted-about awards show, but there was still plenty of great makeup -enough that I figured it deserved its own post while we all stew in anticipation for the arrival of the Academy Awards. Or is that just me? Maybe its because this is my first year as a declared film major and all my classes are buzzing about nominations, but I have been completely dedicated to award season this year. But I digress...Here are some of my favorite looks from the 2015 SAG Awards! Okay, maybe I'm a bit biased at my inclusion of Laura because I just think she's all 'round gorgeous anyway. I'm still obsessed with the video she did with Lisa Eldridge. That aside, this makeup is still beautiful -I love the freshness achieved from the combination of the shimmery eyeshadow and the glowing cheeks. 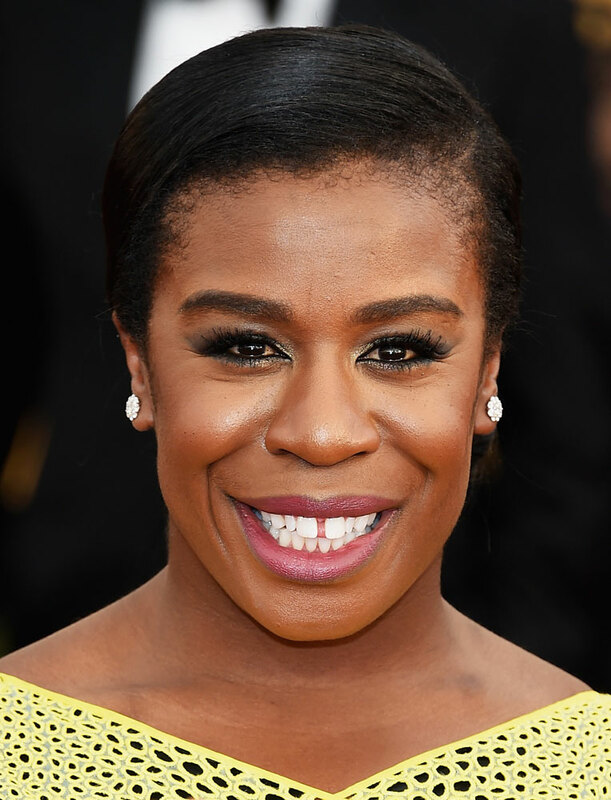 I don't even watch Orange Is the New Black but I was still so happy that Uzo Aduba won the Female Actor in a Comedy Series award. What I've seen of her performance on the show is brilliant and her acceptance speech, I think, just shows how humble and deserving she is. As far as makeup goes, this was the one stronger eyeshadow look that stood out to me. I mean, how can you not acknowledge just how flattering this look is on her? The addition of (is it gold, silver, olive?? can YOU tell??) shimmery shadow is the key, I think. It brings so much life to the eyes. And then the glowy skin and rosy lip color? Perfect. I love the really tonal effect of this makeup. Rose is already my all-time favorite lip color, but the overall warmth of this look makes me slightly obsessed. It makes me wish I looked good in eyeshadow so I could recreate this on myself for the next month. The warm brown eyeshadow leans quite rose-toned in some of the photographs of Emilia on the red carpet and then theres the pink blush. I think what makes this look so appealing is that she doesn't have overly dewy skin. It's rather creamy and velvety qualities that, again, add to this look's overall warmth. And also, it's really giving me a Clarins Instant Light Natural Lip Perfector vibe? Anybody? I won't go on too much about this look because I don't remember being overwhelmed by this makeup during the awards show BUT! Look at this lip and cheek combo! Man, do I love a good lip and cheek duet. I just couldn't not include Lupita for one simple reason...Just look at that glow! Plus her lip color has almost a lacquer finish. Lastly I just wanted to squeeze in my overall favorite look of the night. With out a doubt Maisie Williams. Might be a bit of a controversial choice but I just think she killed it. Dress, shoes, hair, makeup. All complement each other so gosh-darn well. What are some of your awards season standouts?